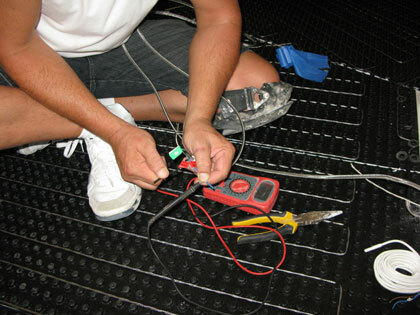 For this topic we will discuss basic electrical costs to operate an electric radiant in-floor heat wire system. If you have any questions regarding this topic, please feel free to contact us at any time. Which In-Floor Heat System Is Right for Me? 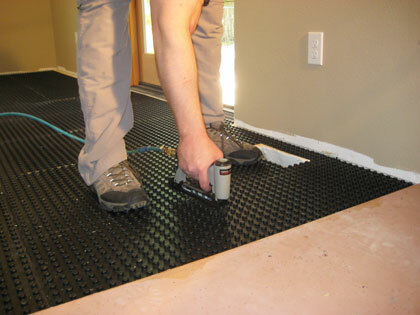 There has been much talk about which in-floor heat system is best to heat under your tile or another flooring. Electric or hydronic heat? That choice depends on a number of factors, such as square footage and installation parameters, which we will cover in a later topic. It has been said that hydronic heating is a more energy efficient way to heat. That may be true on a larger scale, such as a whole house or an entire level. However, for a bathroom, kitchen, living room, family room, laundry room, hallway or a combination of select rooms, electric in-floor electric heat is a very economical choice. Based on a $.10/cent kilowatt/hour electricity charge it will cost approximately $1.00 per 10 sq.ft. per month of heating wire coverage. For example, if you have an 80 sq.ft. heat wire in your bathroom, it will cost approximately $8.00 per month to run 24/7. There are some circumstances that could affect the cost, such as local electricity cost, insulation, heat loss, substrate, type of floor covering used, brand of heat wire used, wire spacing (watts per sq.ft. ), etc.. While the cost may vary depending on the above mentioned, it should give you a good idea of what to expect.